“Everyone is talking about food. Chefs and food critics have become celebrities. 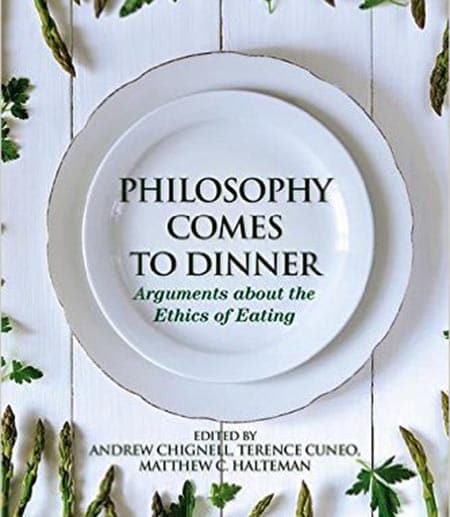 To state that food production and consumption are increasingly in the public eye is to understate the point,” writes Andrew Chignell, associate professor of philosophy, and his two co-editors in the introduction of “Philosophy Comes to Dinner: Arguments about the Ethics of Eating” (2016, Routledge). The book includes contributions from 15 authors on topics ranging from factory farming to artificial ingredients. Other editors are Terence Cuneo of the University of Vermont and Matthew C. Halteman of Calvin College. Part of the book focuses on dietary ideals, explaining different dietary systems and providing practical instructions on how to live out those ideals. The other part focuses on some of the puzzling questions raised by thinking about the ethics of eating: from whether veganism is always best in a complex system such as ours, to the pros and cons of eating local. In that chapter, Chignell explores whether the occasional purchase of a food that’s produced by a system that a person finds morally wrong (whether because of animal mistreatment, poor working conditions or other factors) can still be morally permissible because the system itself is insensitive to slight changes in demand. He also considers situations in which someone is offered these sorts of food products for free – say, at a party or an office lunch buffet. If someone feels that the system that produces these foods is morally objectionable, what is his or her obligation in such situations?